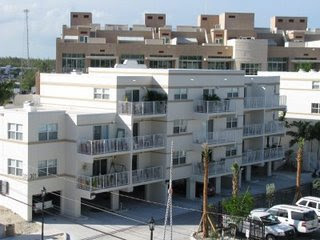 Correction: Credit and thanks to ConchScooter at Key West Diary for the shot of Steam Plant /Railroad Condos. For those interested in real estate trends in the Florida Keys, Coldwell Banker Schmitt Real Estate publishes a newsletter several times a year that includes an analysis of real estate trends. This is the Summer 2008 edition, comparing the first half of 2008 with the first half of 2007. What is striking to me is that there is now 3.7 years of inventory for sale in the Keys, over 4,500 properties, based on historic sales. Not apparent in the Schmitt analysis is that some number of the 4,500+ properties are "distressed" in the sense that they are either in foreclosure or pre-foreclosure, putting downward pressure on prices for all properties. I mentioned Harbor Place a few days ago. Here's a picture of the lone building at the edge of Lazy Way. The rest of the parcel looks like this. Another large development that may also be experiencing a severe lack of sales action is The Steamplant Condominiums at the end of Caroline Street. Here's a picture of those. They are $2 - $3M properties. The adjacent Railroad Condominiums, built as affordable/workforce units, conversely, sold out very quickly in the $200K - $250K range. with thanks to key west diary.